VILLAS AND APARTMENTS TO RENT IN CASTELLON, SPAIN. Welcome to our selection of holiday homes to rent in Castellon, Spain. Castell�n de la Plana is the capital city of the Castell� province. The mountains "Desert de les Palmes" lies towards the north. The city dates back to the 13th century in medieval times and as such, the old town district has many historical buildings and examples of architecture. The modern districts of the city are mainly commercial with a focus on tourism. While the city isn't that large, there are plenty of things to do for a visitor to the region. Just walking around town discovering its history for yourself and taking in the pleasant nature that it has. One particular building is the El Fadri, a tall bell tower from the 16th century and rings once every hour and announcing important city events. There are also several museums to visit, a botanical garden and a planetarium. There are several restaurants around the city and also the province of Castell�n with a variety of different themes, in particular seafood due to its location near the coast, but also tapas, Basque and Mediterranean. Shopping consists of mainly high quality handmade products of but very few mass-produced items - perfect if you are looking for unique merchandise of an individual nature that captures the essence of Castell�n. The city also has a good nightlife in its city centre with numerous bars and discos or even casinos to visit. Sporting activities in the region of Castell�n include cycling, hiking, fishing, windsurfing and sailing. Villages in the region range from modern beach towns with good night life and fishing villages along the coast to rural villages and historic villages; well worth a visit if you find the city to be too busy for you whatever you may want from a village. The region boasts of having beautiful clean beaches, and rightfully so. The beaches are quite popular with the tourists for its golden sands and calm waters. 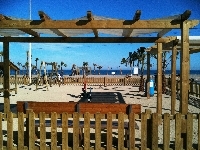 Looking for self catering holiday accommodation in Castellon? Then below is a selection of apartments in Castellon and villas in Castellon that can be rented direct from their owners. You can either click on each listing for further details or you can use our search engine on the left if you are looking for something in particular.